Basil Corn – YOUR Life Through Rainbow Glasses! A few years back I pic ked up a magazine and read the most amazing article about the most amazing person. A woman who’d left her life in the big city to return home to Alabama and buy her own creamery. She began a stunningly successful venture that has earned accolades and awards in abundance. The photo showed her walking in a field among goats. It was beautiful, just looking at it made my heart soar. I wanted be her when I grew up. I’ve often thought things like that, particularly when reading about life on a farm or one of those pretty magazines that show women in aprons with contented smiles on their face like they woke up in one of those early Judy Garland films. Well guess what? I talked to that very same woman on the telephone yesterday. We were introduced by the photographer for my book, Jennifer Davick. Jennifer had been to her house recently to do a photo spread for an upcoming story and as it turns out, the woman walking among the goats in that idealistic scene lives about ten minutes from where I am. After a brief email introduction we found ourselves on the telephone talking kids and food – and I realized, the woman walking among the goats was just like me in more ways than not. I try to always appreciate what I have and focus on the positive. Last year, when we moved to our new home, I felt a tremendous appreciation and gratitude towards not only the house itself but the land surrounding it as well. Everything was green and lush and to me it just looked magical. Wildflowers sprang forth in little nooks and crannies like treasures presenting themselves to me. Ferns sprouted up randomly out of the yard as if they are checking up on us and just wanted to say “hi”. Having always longed for a hydrangea bush, imagine my delight at finding not one but seven hydrangea bushes flourishing in my new back yard, each producing my favorite color of hydrangea – blue. I had found, in my mind and my heart, a utopia to raise my family in. I wanted my new home to have a name and eventually (through a neat course of events) settled on Bountiful, due to all of the bounty it had offered up to us as a family. I’ve often had folks email me when I speak so lovingly about Bountiful and ask me where it is. Since I view my home in a very romantic fashion, I tend to talk about it that way as well. From time to time I show photos from my yard and take care to frame them so I can bring you the beauty that I see. Over time, people have come to think of Bountiful as if it is some grand Southern plantation and in my mind, it truly is. If you were to come visit Bountiful, though, you might be at once struck by the fact that it rests right smack dab in the middle of an ever crowding city and close enough to municipal buildings that every time there is a medical or police emergency our serenity is pierced with sirens and flashing lights. But to me and to those who read my ramblings, Bountiful is how I see it. It is my home, my utopia, my own Southern plantation. I don’t sit around wishing for white columns on the front porch, instead I focus on the lush green grass and the gardens I planted with my kids. The strong and sturdy walls that protect us from the elements and the sunshine that beams into my window each morning. I decided to fall in love with my home and each day I decide to fall in love with my life. I make it a point, whenever I put those rainbow colored glasses on that we tend to view other people’s lives with, to look into the mirror and be sure to give my own life more than just a passing glance. Your life deserves no less. Now that I’m off my soap box and we’ve passed out our rainbow colored glasses (make sure you got a pair! 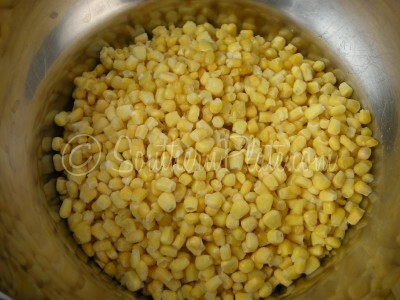 ), I’m gonna bring you today’s recipe: Basil Corn. This is a quick and easy go to side dish for me that uses frozen corn and ingredients I have on hand. It is a neat way of sprucing up corn when I can’t have fresh and the hubs and son love it. 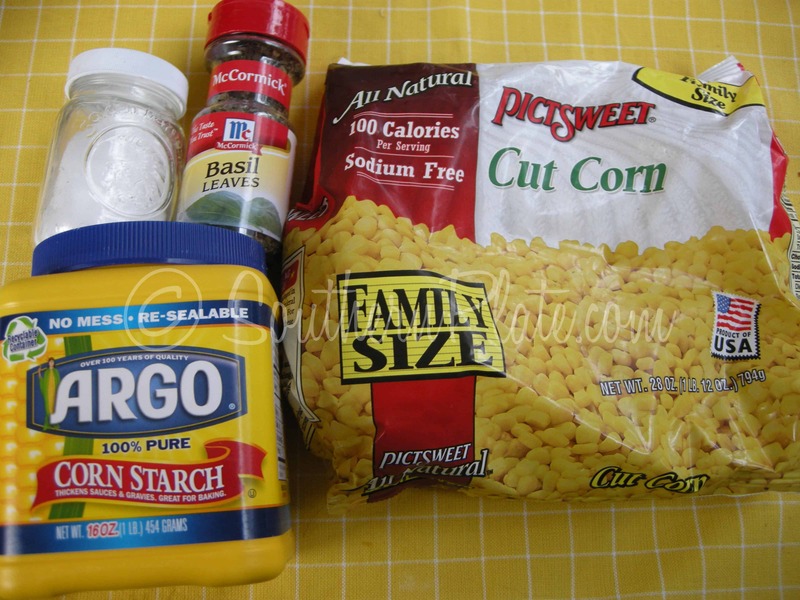 You’ll need: Frozen corn, salt, basil, corn starch, and butter. One stick of butter is not pictured. Use butter or margarine, whatever you have on hand. Pretend you see a smidgen of sugar in there, too. I don’t sleep much lately so y’all gotta bear with me here. 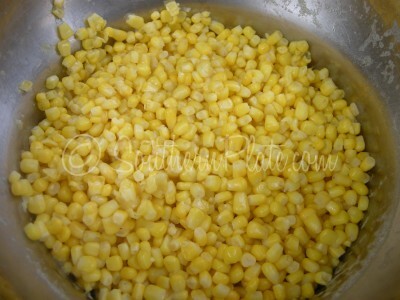 Dump your frozen corn in a pot. Bring that to a boil over medium heat and then drain. 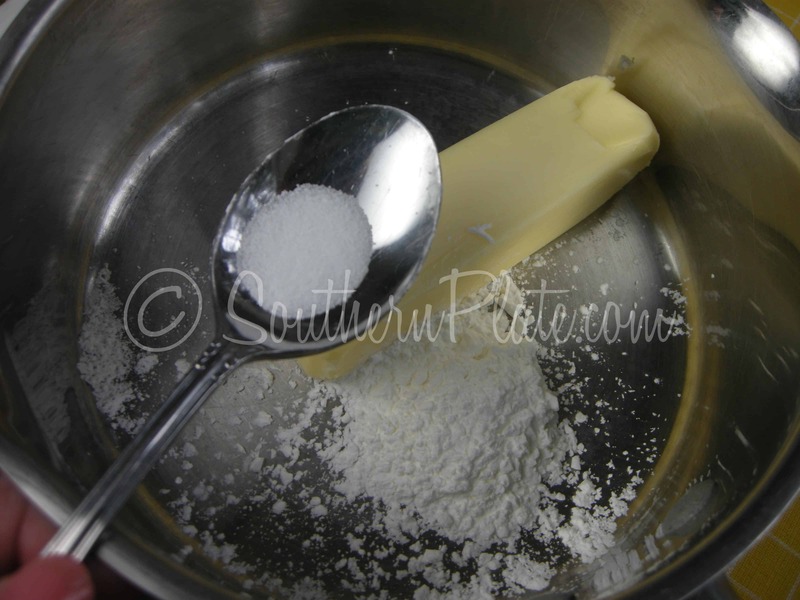 In a sauce pot, place your stick of butter and add a tablespoon of cornstarch. and a tablespoon of dried basil. Now you can add a little more if you like but I’d start low. 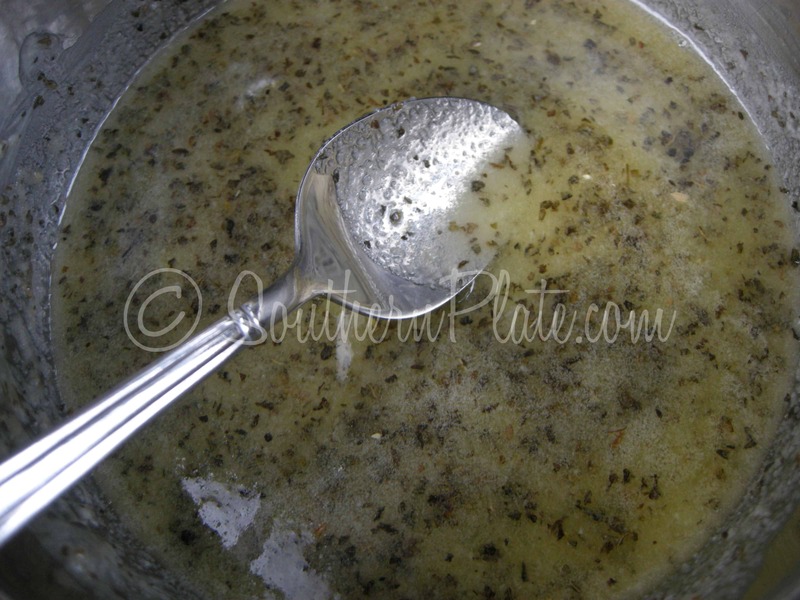 If you aren’t sure how your family feels about basil, you might want to do 1/2 tablespoon. Put that over medium heat and stir well until all of your butter is melted and the corn starch is blended in well. 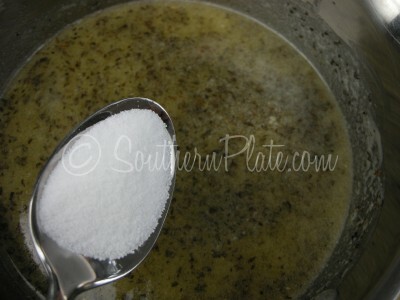 then add about 1/2 a tablespoon of sugar. Pour your butter sauce over it. Now y’all don’t go getting into a tizzy because I put a whole stick of butter in here. You’re gonna stir it all up and a great deal of it will end up sitting in the bottom of your pan so just use the whole stick and take a deep breath. It’s gonna be okay. There are far worse things you could do. aww, it’s posing for us! Growing up, Mama always had two or three sides as well as a bread and a main entree at every meal (dessert, too!). I’ve found, though, that my family really only needs one meat and one side and so most of our meals look about like this one except for when we have company or on weekends. If I made two sides, food goes to waste (or gets recycled into leftovers). If I make one side, we have just the right amount. You gotta go with what works for you. I was talking to Mama about this today and said “You know Mama, I feel bad putting a picture up on Southern Plate of just one side, it just doesn’t look right”. 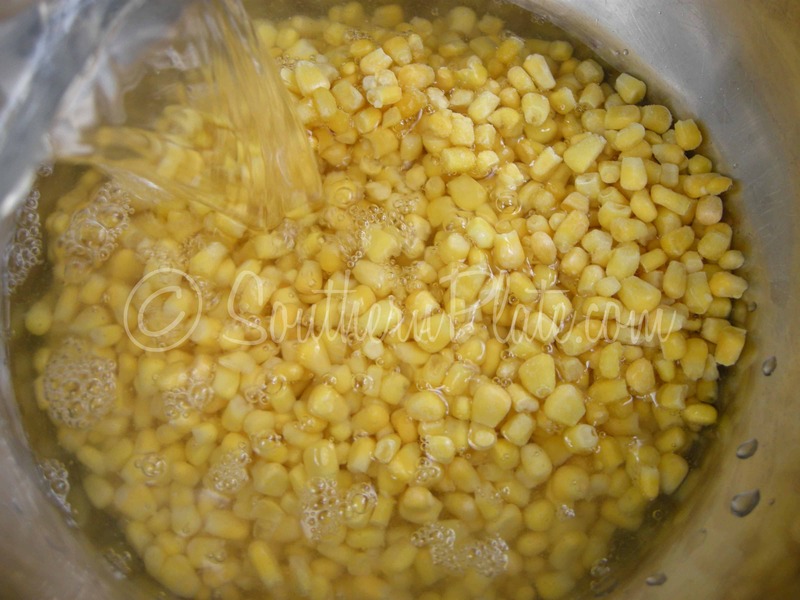 Pour corn in large pot and cover with water. Bring to a boil and remove from heat, draining corn. In sauce pot, place stick of butter, corn starch, salt, sugar, and basil. 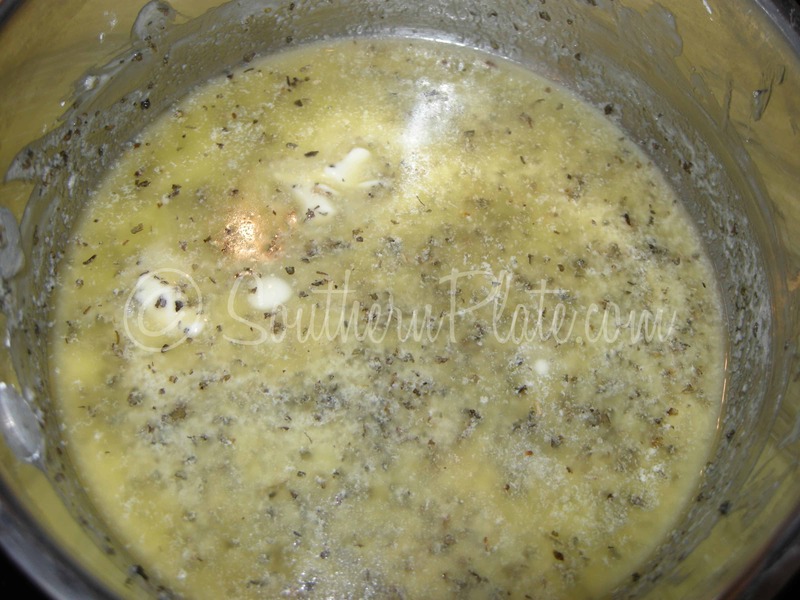 Heat over medium heat, stirring constantly, until butter is completely melted and mixture is well blended and bubbly. 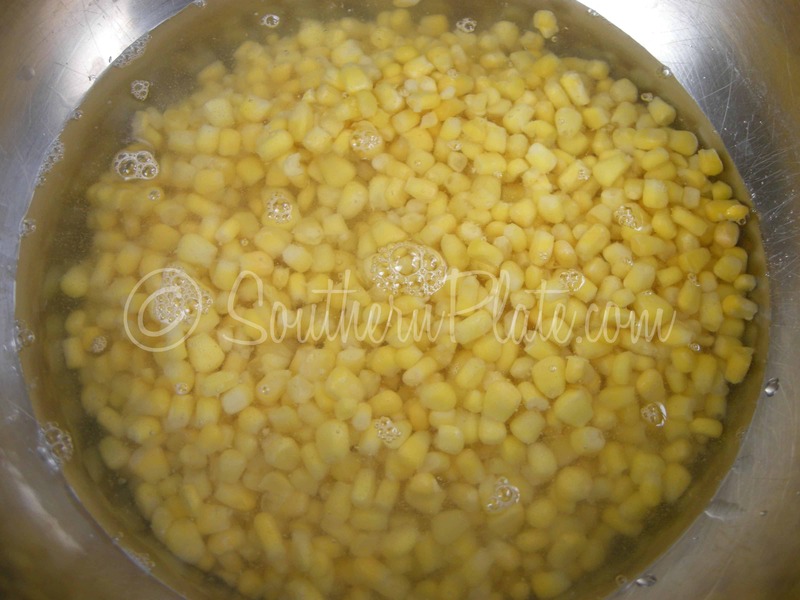 Pour over corn and stir to coat well. Serve! Lets chat in the comments. Tell me about rainbow glasses, what you see in your life when you put them on, and how you’ve modified traditional cooking or servings to work for your family today. Oh and by the way, have I told y’all that I love you lately? Well I do. The struggle stops when the gratitude begins. Submitted by Iplayoutside the box. Submit your quote or get more by clicking here. Meet The Photographer Behind My Book & More! Now that makes total sense…. see your a smart lady!!!! Thanks hun! Yum, thanks Christy. I love the story and need to remind myself of that also. I like the comment about “blooming where we’re planted”. I actually have some fresh basil; would it be okay to use that in a smaller amount? I’d pick fresh over dried in a heartbeat! 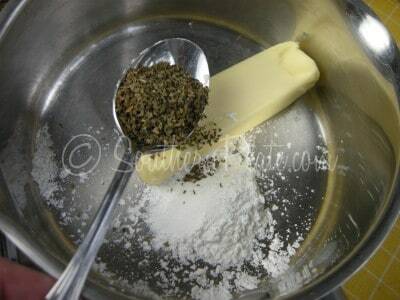 Cut you up about two tablespoons of it, then add more after you taste it. I wished I could just make one side to go with my dinners. I was raised like you Christy, or like your grandmother used to.. my mother would put a spread out of food that you cant even imagine.. then after cooking all that, we had the cucumbers, cantelope, onion, hot peppers cole slaw and a southern staple with every meal… Corn Bread… I just cant get past this. My husband keeps telling me that all we need is a meat and one veggie, but alas, I still make 2 or 3 to go with it… and its only the 2 of us. Occasionally I will cook for my sis’s family but our schedules are different and its hard to get us all together. Needless to say, I waste alot of food when I cook like this, because I don’t eat left overs, or at least very rarely. So I guess the point i’m getting to is that this year, i’m canning and freezing portions just for 2. I’ll let you know how that works out for us!!!!! I’m gonna pass my rainbow glasses on to someone else because I, just like you, already love my life! Hubby thinks I’m insane because every day I go on about how much I love this house. Even after living here for 5 years. He just rolls his eyes. But I think he’s catching on. He was in the yard the other day and he came inside and beckoned me outside to show me our irises in bloom. My heart just sang! He just giggled. Christy, I just love when you pull out that “soap box”!! Thank you for the rainbow colored glasses..I am filled with thankfulness for all the “good-ness” around me today! 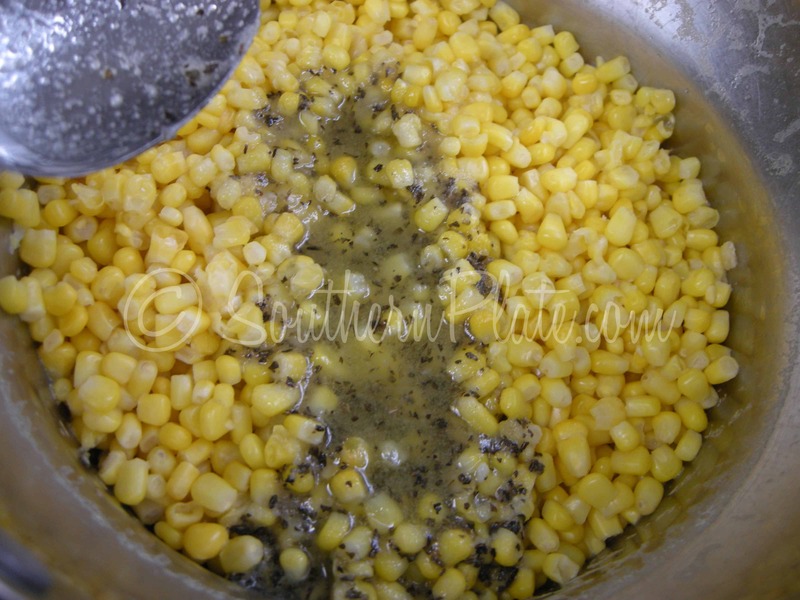 I look forward to trying the basil corn..looks so good! Sending you love and Bountiful Blessings my friend! You are so right! I recently had the revelation that if I romanticized my marriage in the same way I enjoy novels, or hearing others’ love stories, then I have a much deeper appreciation for my husband and our life together. After all, it is our own little romance!! Thanks for sharing. You verbalized so well what I have been experiencing! Although they don’t always tell us when they’re younguns, the things we do for ours gets noticed, and appreciated. Just like we appreciate you sharing your heart and life with us! So I am sitting here working at my computer, smelling baby back ribs baking… and instead of thinking about work, all I can think about are side dishes. And then magically, your email appeared! Christy…thank you for the reminder…somedays we all need those and today was mine..Basil corn sounds so good I will try it tomorrow. I am a newcomer to your site and I have so enjoyed it. I have passed it on to everyone I know. Thank you for giving me the joy of cooking!!! I was raised in a home where mother put one meat (usually red meat), at least one green veggie and one starch on our plate every dinner. If the garden was in high production, we ate plates of whatever was fresh from that garden, too. Daddy’s tomatoes were GIGANTIC and in the height of the season he brought in 5 gallon buckets every day for weeks! Now I try to put out this kind of plate for my family of 4 every night. One thing that helps us not to waste food is I bought a good stack of those plastic containers that have compartments. When dinner is over, I make lunches for my hubby and myself with the leftovers. The trick here is to call them ‘planned-overs’; sounds better that way. Enjoyed your thoughts today. I have found that when I compare what others have to what I have is when I tend to get unhappy. There will always be folks with more this, prettier that, faster cars and bigger houses. Everything I have I came by with good, honest work. I inherited little more than my mother’s three-legged Jack Russell terrier (her last joke on me!) and I am proud of my accomplishments and my mistakes-they make me who I am. Hey Christy, I have a question?? 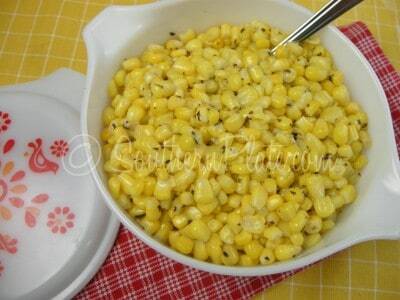 Can you just warm the corn up in microwave with out all the water and then just put the good stuff on it? OR wait new thought how abouts just cookin it all in same pot I don’t cook/boil my frozen corn. 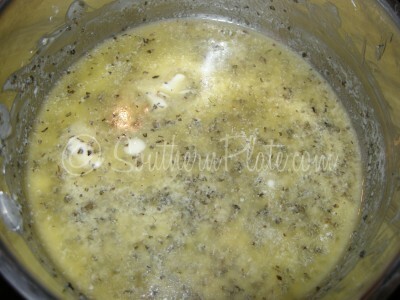 I normally (who said I was normal ~grin~) just add butter & crn to micro safe dish an hear er up Think it might work this way? Let me know a.s.a.p. I have corn in freezer and need to be fixin supper soon before church tonight. That’ll sure work! long as you give your corn long enough to cook. 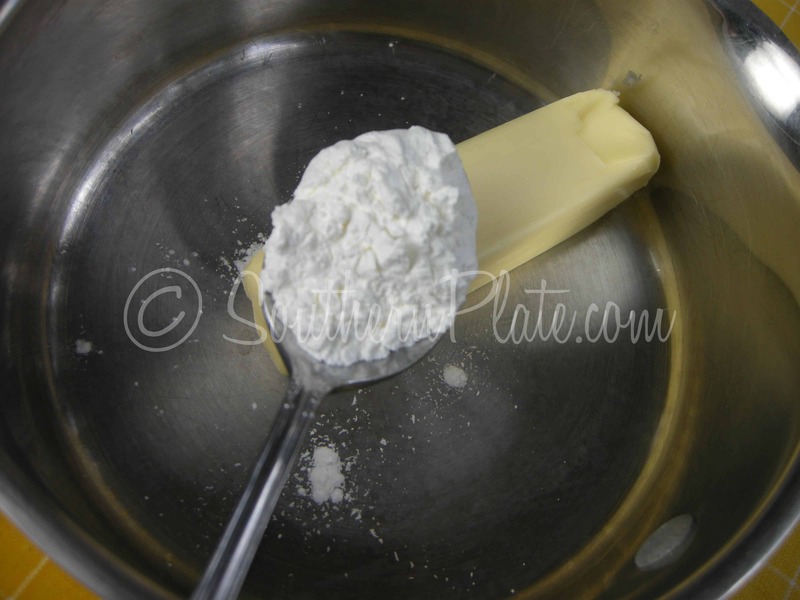 I’d do the butter sauce in a separate dish on a different cycle though, so you can get it good and hot and get that cornstarch dissolved in it. You may end up with lumpy sauce otherwise. 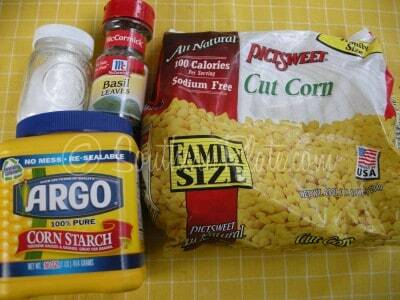 You could, of course, cook your butter sauce first, then add your corn and cook it. Maybe thaw it beforehand to cut down on cooking time in the sauce. Just a thought! You’re brilliant, btw. I was also raised to fix more than one side dish with a meal. My mama said you had to have a meat, green veggie and a starch. For years my family endured my attempts at fixin a balanced meal while being a working mom. Canned veggies are just not appealing to little boys (or grown men). For dinner last night we had meatloaf and boiled new potatoes in butter. I asked my husband if I should open a can of green beans and he said, “Why?” Everyone ate and they were happy! That’s all a mother can ask for! I can’t wait to try the Basil Corn. I bought two basil plants and thought, “What am I going to do with all that basil?” Now I have something new to try! Deciding to quit my job and take care of my dad was a very hard decision for me. In the end I trusted God and went with what I felt he was telling me through prayer and his word. I knew we would scrimp by but what a blessing it was. We always have enough. Some how, some way God provides exactly how he promised he would. It makes me feel sorry for some people who never know the joy of being taken care of by the creator of the universe. Both my trucks need major repairs as does my house BUT..I am so VERY thankful for everything we have! Thousands of people would change places with us in a heartbeat. As fellow Southern Plater (and major cutie pie), Su James, said in a Facebook post. “Somewhere, somebody is in a hospital begging God for what you have right now, step up to your moment”. Stop looking at what is lacking and start being thankful for what you have. It may be difficult to see at first but try this. You’re obviously able to read this. You have a computer available somewhere.. your eyes still work. Your mental capacity allows you to understand what you are reading. Quit looking at the weeds where you are planted. I love you guys and gals. Be blessed. Those are some very wise and fitting words. Sometimes you do find yourself blinded by thinking about what you don’t have, not appreciating everything you do have. And when you do stop and think about all that you’ve got, you realize how rich your life is. I’ve always believed in blooming where you are planted, even tho I was planted in an entirely different spot than I (or my husband) envisioned! We always had a huge garden and I canned and froze every vegetable we ever ate. Now I live alone and my grandson built me a 4X8′ raised garden so I can have occasional meals of good fresh vegetables and I love it. Christy, you are so good for my soul!!! You make me see the good in everything – and in every taste of the good stuff you create every day! 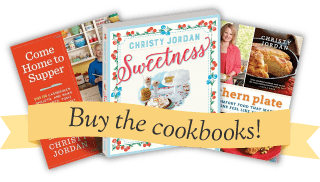 I have my pre-order in for your new book – can’t wait! I lost the post about your broken red casserole. Can you repost that for me? I just scanned it briefly, but I felt so bad for you. Maybe I can find one for you some day!! This was just what I need to hear today. 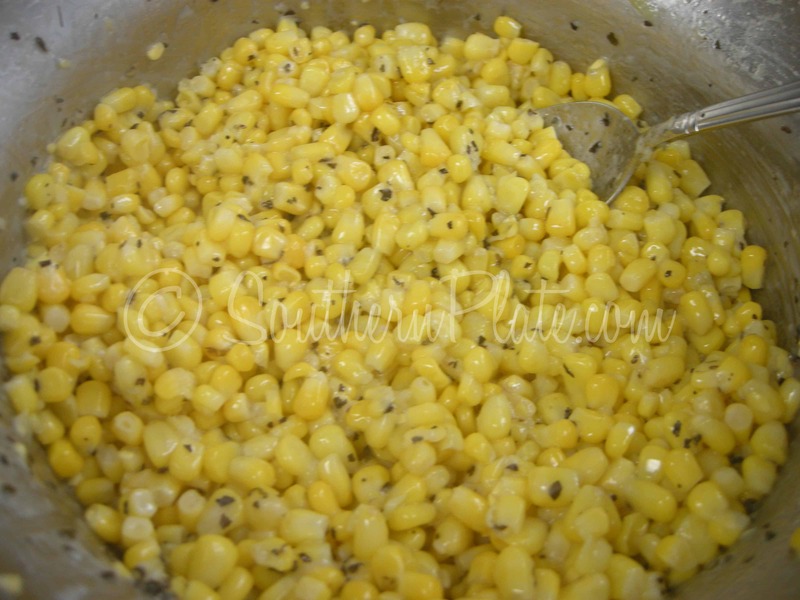 The basil corn looks really good too! What a wise young woman you are, Christy. Thanks for brightening many of our days. This story was “extra icing on the Christy cake dejour”. The artist Mary Engelbreit uses the “bloom where you’re planted” phrase on many of her cards and artwork – if you have never seen her work, check it out- very common sense and right on the money talent – just like you. YUM! I love corn, and basil also. In fact I’m going to try growing some fresh this year — lemon basil and lime basil. They sure sound tasty, anyway! I may try making this with either or both when they are ready to harvest. In the meantime though will adapt this for 2 servings (me plus leftovers for me another day)…can’t wait to try it! I may try it with dill, as well (I love dill, too). Diane in PA, where today it’s cold…low 50s during the day and down to 32 at night…Brrrr! Where would we be without our friends eh? This post is perfect for me today; I needed those glasses! =) And the recipe looks great too. Thanks! Hi – It took me a long time to get to just fixing 1 side dish. I seldom have food go to waste this way. I know what we really like and fix that. I do try new recipes, but gone are the days of meat, several vegetables, starch and all the trimmings. Money is tight and I hate to clean out the refrigerator and end up pitching things that never got used the 2nd time around. One time I was complaining about having to do the dishes and my mother reminded me…….that it meant we had food to eat! I really took that to heart. I think about that often when I do the dishes. Great post! I’ve been accused of having rose colored glasses on too & I think it is an excellent quality to have! We call our 4 acres “Dixie Blessings Farm” & it has been a true blessing to us. God has blessed us with so much – and I have just recently been able to quit a stressful full time job to become a stay at home mom to three teenagers! God is so faithful! Dear Bill – you are so right. However,sometimes it’s hard to see when the glasses are misted up. Dear Christy – I love the thought of blooming wherever you are. I love to read your posts. It reminds me so much of how I grew up. I am from AL too. My Grandma cooked the same way. She could make a meal out of nothing it seemed. 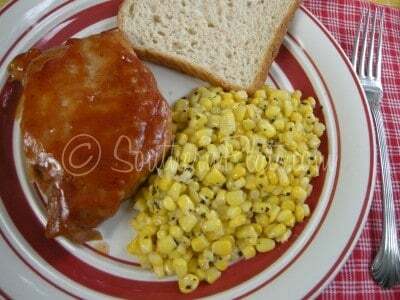 She always had to have a bread, cornbread or biscuts (hot from the oven) and a meat and at least 2 or more sides. That included homemade sweet pickles, onion and sliced tomatoes (from her garden)and she would have some kind of dessert. I miss her so much. I love to cook and I owe that to her. Thank you for reminding me to be thankful for what I have. Oh, the wisdom of our Mama’s. Mine has been gone a little over a year now and some days I feel like I can’t get through the rest of life without her. Mama was a true southern cook and I miss sharing recipes new and old with her. We lived about 1,000 miles apart but we would watch Food Network and discuss the dishes. I miss my beloved South but I do embrace my life as a Dixie transplant here in SC Kansas. I tell everyone that I traded my Georgia piney woods for the Kansas prairie winds. If you are ever out this way stop by “Wall Meadows” and visit. No, I don’t have a Meadow. Just a wheat field behind my house that belongs to my neighbor. Each day is a gift. Hug your Mama! Kiss your spouse and spoil the kids! It is nice to be happy, ain’t it. Wonderful post, Christy. Corn is my absolute favorite veggie so I am looking forward to a new way to try it. I might do this tonight to go with our baked spaghetti!